As a web developer working in the Microsoft space I hear this statement a lot. Go check out the IE UserVoice and you’ll find this. I want to talk about why this mindset of “just use WebKit” is a dangerous one. 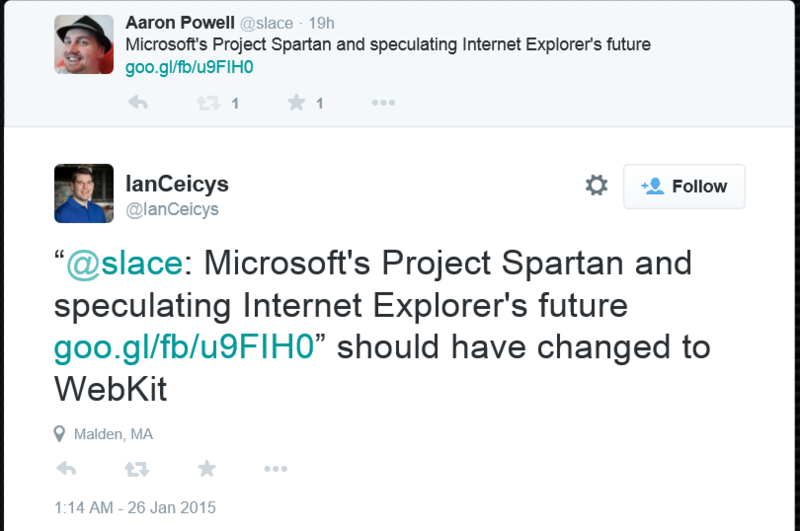 When a lot of people say this to me most of the time they are actually saying that they’d prefer IE to be Chrome. It’s somewhat strange that so many web developers seem to have forgotten that Chromium forked WebKit and made Blink nearly 2 years ago. Blink just still uses the -webkit vendor prefix rather than creating their own because it turns out that web developers are pretty lazy with vendor prefixes, so much so Microsoft supports -webkit. Chrome’s not WebKit, who is? Right, if Chrome isn’t WebKit then when you’re using WebKit you must be using Safari right? Well… close but not quite. Paul Irish has a good write up about the breakdown of WebKit. It’s a bit old, pre-Chromium’s fork, but a lot of it holds true still, most browsers still swap out parts and let’s not forget that Safari’s work is done in private before being pushed downstream to the OSS project, or at least that’s the expectation. Alright, maybe I’m getting hung up on WebKit specifically, let’s get back to the common point “be Chrome”. As a web developer this is one of the most scary concepts, having a browser monoculture. I’ve been working in the web industry for 10 years, so I came in on the tail of the browser wars, just as IE6 had become the winner. I remember developing for Netscape but it was already becoming a rarity, we had entered an era of monoculture and the only browser was IE6. In this era the web stagnated, there was no innovation going on, there was no incentive for innovation because after all there was no competition. I don’t want to see this happening again. Currently IE vNext (which will be the core of Project Spartan) and Firefox 37 (currently nightly) are on par with Chrome 41 lacking a bit (although Chrome 42 which is the latest Canary has 52% coverage). Dropping Chakra for v8 would be a bit of a backwards step in terms of ES6 support wouldn’t it? Similarly Can I Use can produce a good comparison between the browsers on a broader feature set. What we can see is that different browsers implement different features at different rates, and this leads to innovation. Browser A implements something, gets feedback on the implementation, other browsers implement it, problems are found, fixed, redesigned, rinse and repeat. In fact this is how standards happen. The trend of web developers thinking that there should be only a single browser engine is a dangerous one, we saw what happened after the last browser war. Competition is an important part of any industry and the web is no different. Trident as it was in 2007 is very different to the Trident of 2014 and we know that Spartan brings changes to put the legacy in places that are even harder to get to, and this is thanks to competition. So don’t be narrow minded, understand how the web platform works and why multiple players are the only way we’ll continue to evolve the web in the way we want it to.